Is it possible Garra Rufa fish to spread diseases and infections? This is one of the most frequently asked questions that worry our clients. The Garra Rufa fish cannot spread infections or diseases. It is important to know that the water in our studios is subject of constant purification by biological filtration system, which is situated under each seat. In addition, there is an UV filter treatment, which sterilizes and kills all microorganisms, guaranteeing the perfect hygiene. How often the water in the tanks changes? The water in aquariums refreshes every day and we clean all of the system inside once a week. Are there any chemicals and preparations in the water? All of the preparations that we add in the water are completely harmless both for the human health and for the fish. These special preparations neutralize the chlorine and heavy metals in the water. What happens if we have open wounds? Open wounds should not be in touch with the fish. In our studios, we have special waterproof plaster strips that we cover the affected areas and our clients can safely enjoy to the fish spa procedure. Are there any negative side effects of the procedure? The fish spa therapy has not any negative side effects if all hygiene conditions are met. How many procedures will I need to have visible effect to my skin? The frequency and number of the procedures are completely individual depending on type of the skin. There is no limit of the number of procedures depends of customer’s wish and needs. Which parts of the body does the fish spa therapy suitable? Usually the fish spa therapy is suitable for the whole body. Our studios are mainly concentrated on the procedures to the feet and hands. Do the Garra Rufa fish bite and does it hurt? Not at all, the Garra Rufa fish is toothless so the experience is completely pain free. 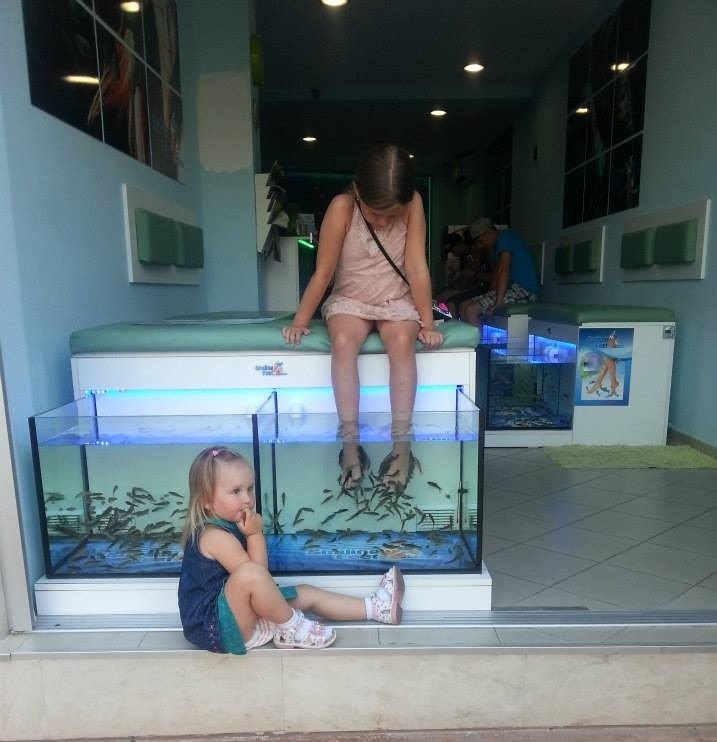 Does the fish spa therapy is reliable for children? As mentioned, the therapies are extremely harmless, hygienic and pleasant so there is not a problem to be tried from children also. Do the fish get other food, and not just dead skin? Yes, their diet is supplemented with a special formula of fish food, vitamins and minerals, as the most important is to keep them healthy and happy. What is the temperature of the water is the water cold? The water is nice and warm between 28 ͦС and 30 ͦС.